The last bit of land next to the big glacier: Vibebukta is the last part of unglaciated coast on the southern side of Nordaustland. There is nothing but glacier ice further east, the large ice cap Austfonna with its famous, about 170 km long calving cliff and meltwaterfalls. 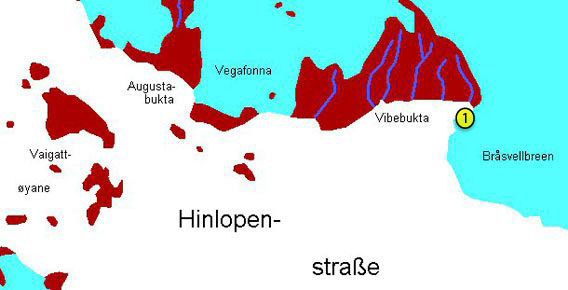 The first part of Austfonna is Bråsvellbreen, an ice stream that accelerated in the 1930s, but it is not visibly different from the rest of Austfonna. 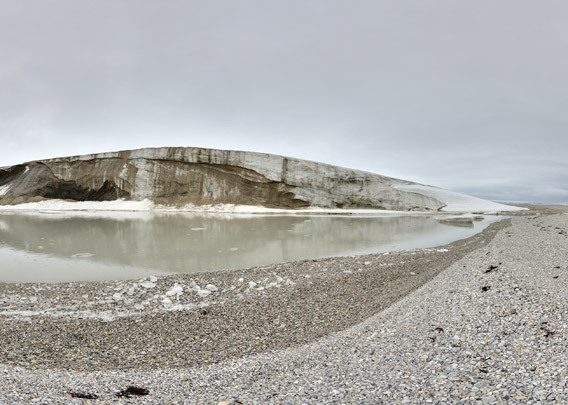 This panorama is from a small gravel and moraine peninsula which is really the very easternmost, last bit of land. It has been glacier-covered until not too long ago, when the ice cap retreated beyond this position. It is not even indicated on the digital topographic map of the Norwegian Polar Institute. But it must have been there long enough for several polar bears to die there, they seem to have liked the place for that purpose, as the remains of several ones are there within a small area. The morains are fascinating, and so is obviously the neighbouring ice cap.